We look to parents to work with the school to ensure that children come to school always maintaining a high standard of dress. At St. Joseph’s, our children always wear their uniform with pride. From January 2019 our policy has changed slightly with our expectation.Please click on the link below to see the full policy. 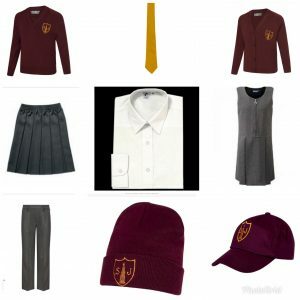 Smith’s Schoolwear: 155 – 157 Lancaster Road, Enfield Middlesex EN2 0JN. Tel: 0208 363 2424. There are no minimum order quantities and your uniform will be delivered directly to your address, there is a delivery charge for orders under £50, however we will be offering a free click and collect option where orders will be delivered to the school and will be available to collect from the school office on a Friday, if orders are not collected within one week they will be returned to the shop. Other ordering information including sizes, delivery information and the returns procedure is also available on the website.